A great looking outdoor Nativity display that won't break the bank--because it is made entirely of wood salvaged from old shipping pallets!! 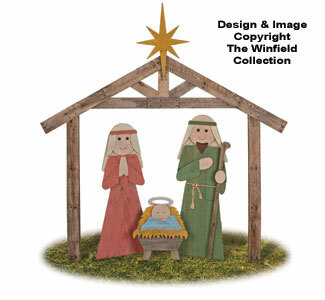 Plans include full-size patterns and step-by-step instructions to make your own pallet wood Mary, Joseph, Baby Jesus plus the Stable and Star. All can be painted using color washes that show off the unique character of the pallet boards or simply solid colors.